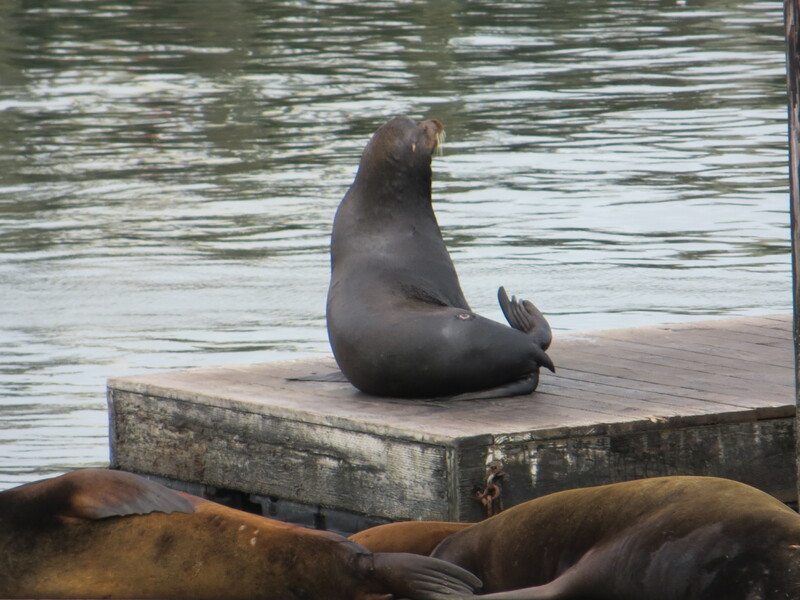 Seal you at Pier 39: Adventures in San Francisco! Zoom, zoom! 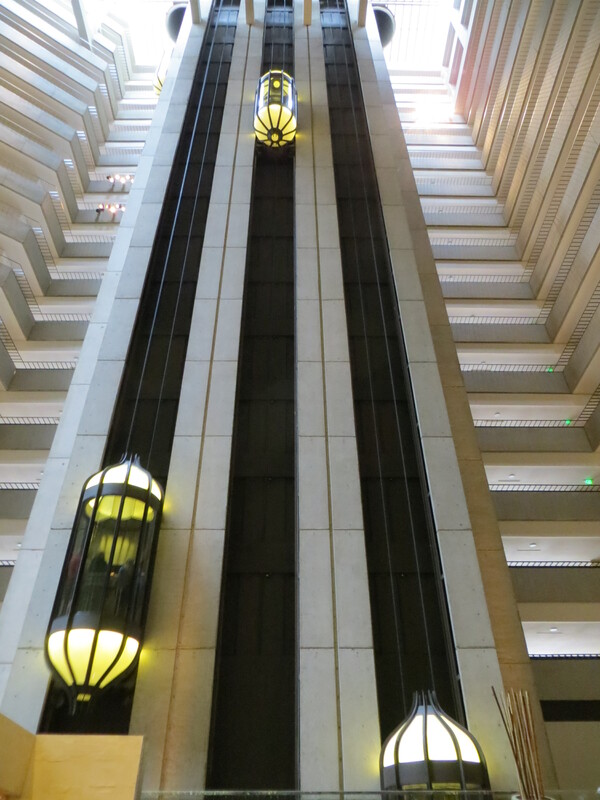 Fast elevators at the Hyatt. 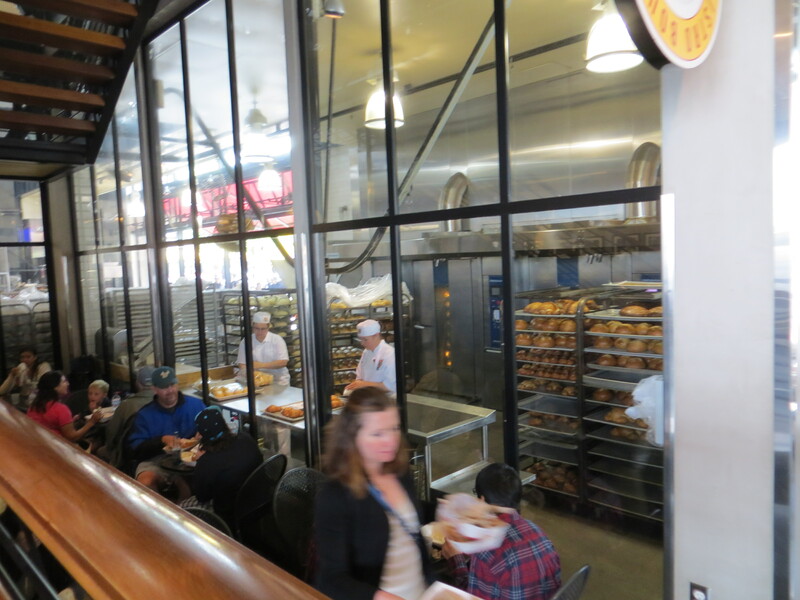 Although the main objective of our recent San Francisco trip was, of course, to run in The San Francisco Marathon, it was also my first time in the city, so I was excited to pack in as much sightseeing as possible in one weekend! 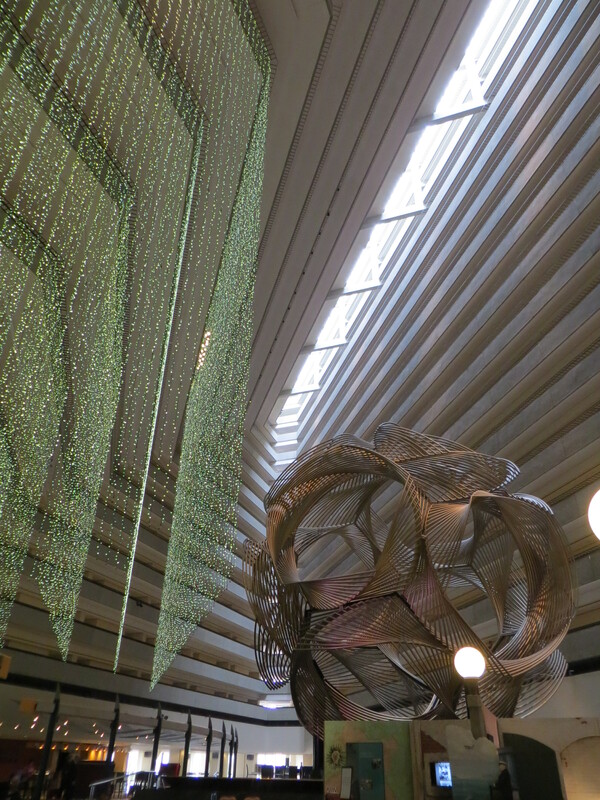 Our first night, we stayed closer to the airport, in Millbrae, but on day two, we hopped the BART downtown to the Hyatt Regency – Embarcadero! 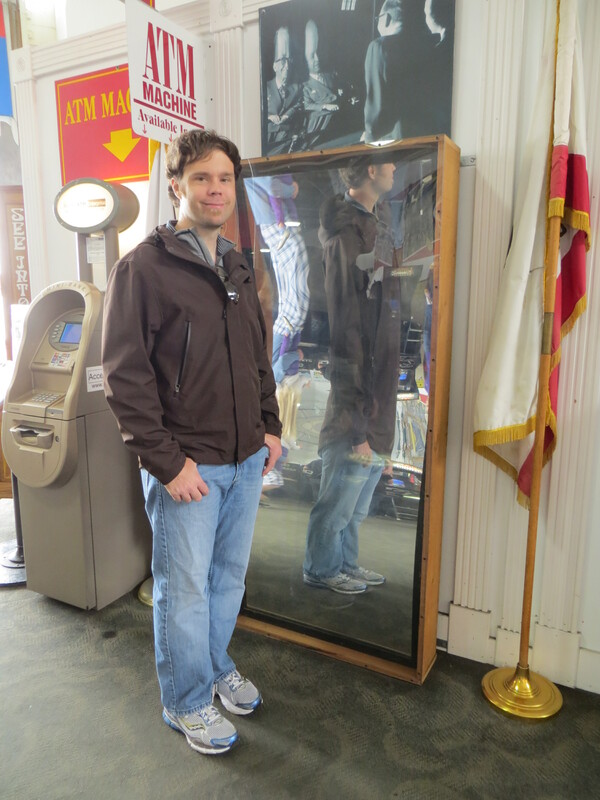 I was immediately impressed by the retro-fabulousness of this atrium – and if you are a film buff, you might recognize it, even if you’ve never been there! The hotel itself was very nice: large, clean rooms, great views and of course, an excellent location! 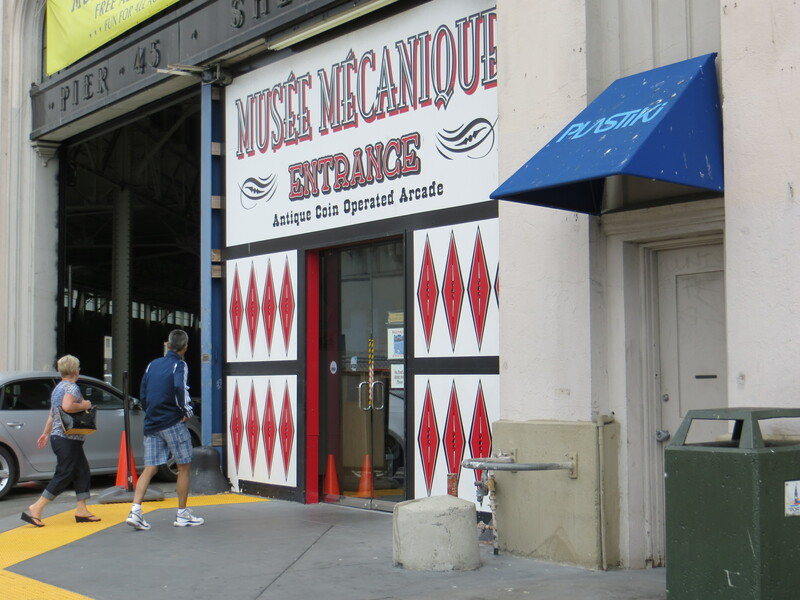 As host hotel for the race, it was a stone’s throw from the race start/finish and also centrally located for public transportation and sightseeing (it’s right across the street from the Ferry Building). 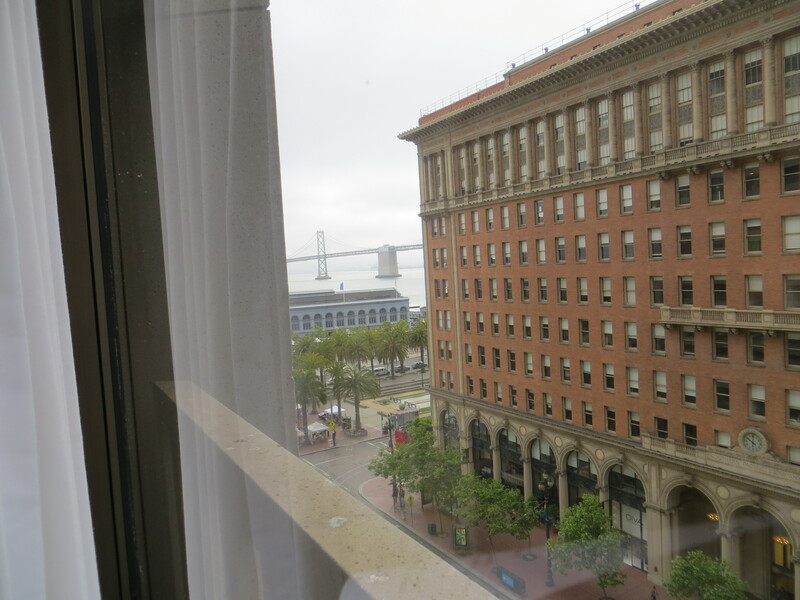 View from our room; you can see the Ferry Bldg as well as the Bay Bridge! 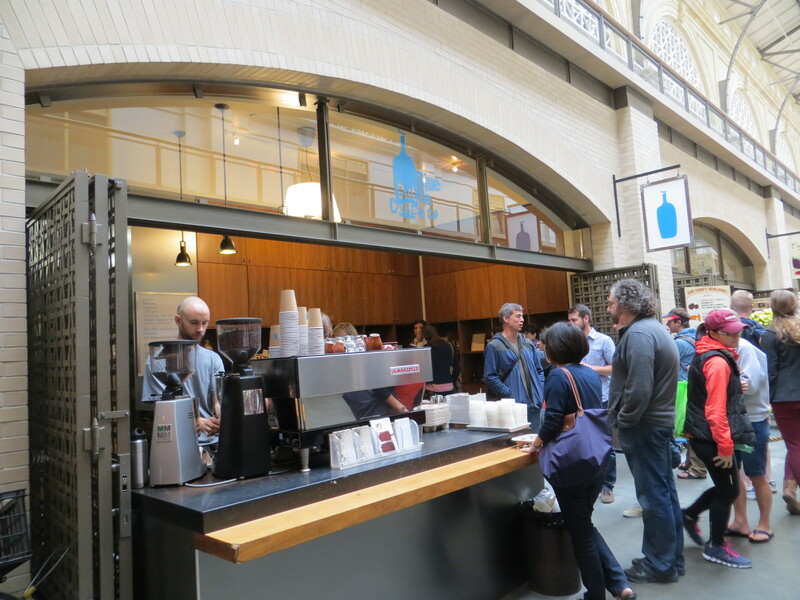 After settling into our room (we were excited that a room was available so early in the day – around 10) we set out for our first stop: visiting Blue Bottle Coffee! Monica, of Run Eat Repeat had raved about it serving “the best ever iced coffee” so I knew I had to pay them a visit. We waited about 20 minutes in line, but boy, was it good! I ordered the “New Orleans Style Iced Coffee” and hubs wanted to try the yummy smelling waffles! 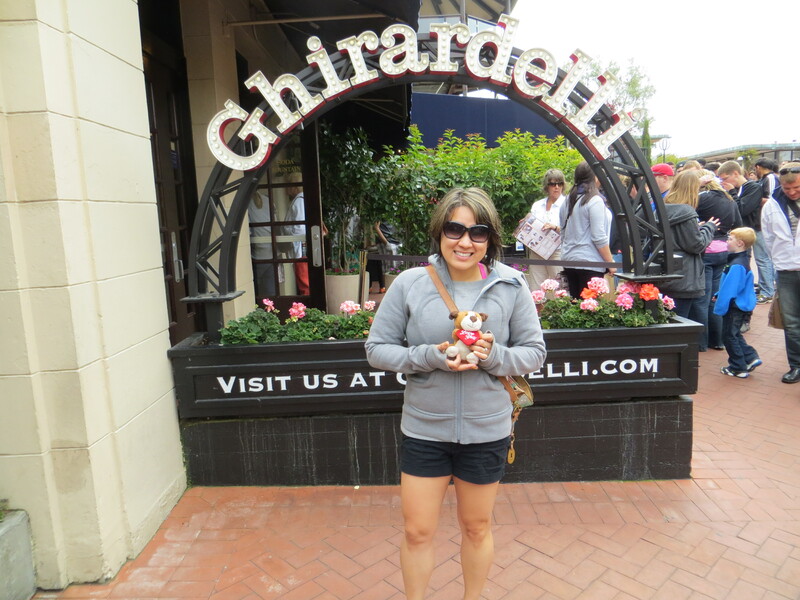 Neither disappointed, and they were perfect snacks to take with us on our walk toward Pier 39/the Fishermans Wharf and Ghiradelli Square! On the walk up, we ran into my friend Linzie (so cool when you see friends in unexpected places) who I was planning on meeting up with later! After a quick chat, we bid farewell for the moment, and we set on our walking adventure. Although it was a little windy (ya think 😉 ), the temperature was perfect and the walk was very pleasant. There were lots of cyclists, runners and tourists – a great mix, which made for excellent people-watching. 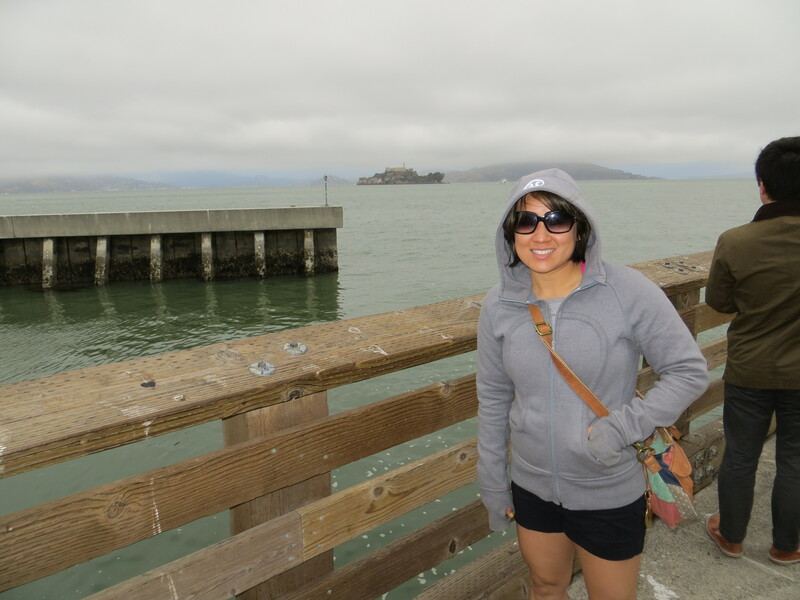 We hung around there for a while, and checked out the views – it was pretty clear and we could see Alcatraz…we didn’t have quite enough time to visit on this trip, but it was really neat to see in person. 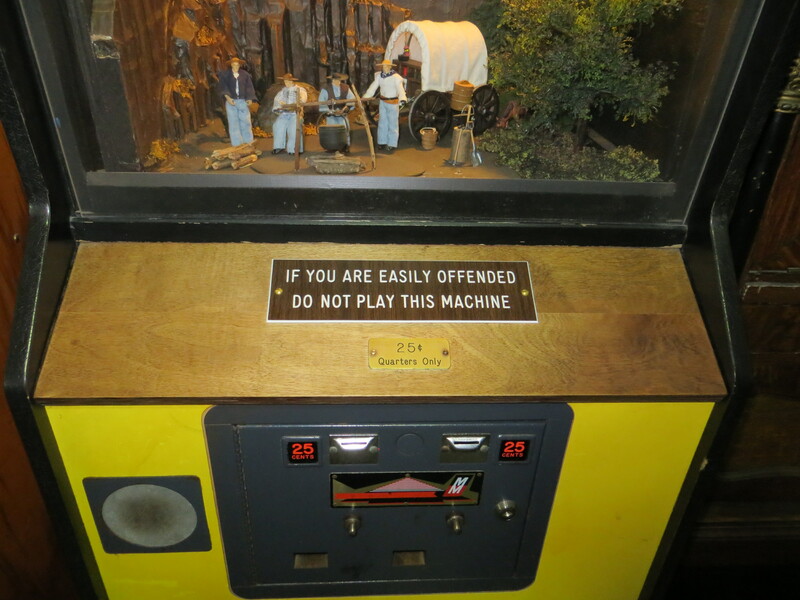 We broke a $5 bill into quarters and played a few games, did a few fortune teller machines and of course, made a pressed penny for my collection. It was definitely a cool stop and I’d recommend it to anyone! 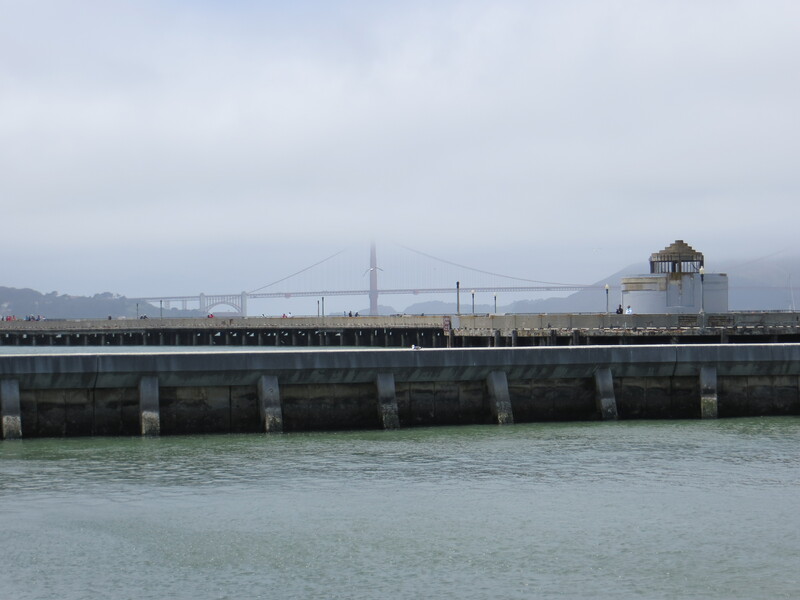 …first glimpse of the Golden Gate Bridge! Yes! Although there was a faint layer of fog, I could see it! Very exciting!! 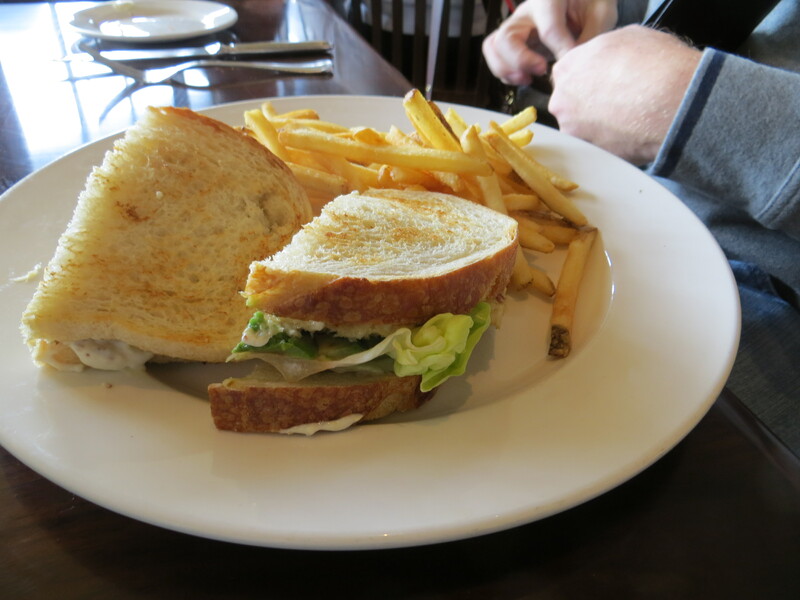 It blew my mind to think I’d be running over it the very next day…but first: more carbs! Ice cream + friends = happiness. Definite tourist attraction! Loved it! At this point, we had walked somewhere around 7.5 miles, according to my fitbit. 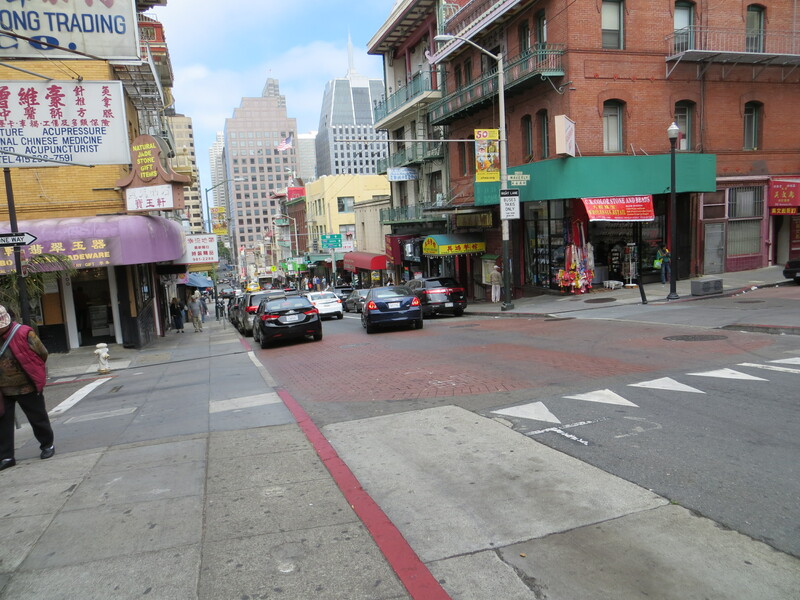 Since hubs was a little nervous about the race the next morning, we decided to head back to the hotel, this time cutting through Chinatown and some other neighorhoods. We called it an early evening (although I walked back to the Ferry Building to grab hubs some items for breakfast, and wandered a bit, reaching 11 miles walked) and settled in the hotel watching the silly ‘Mermaids’ documentary on television. It would be an early wake up call and a packed Sunday (the race, my plans of visiting the Presidio, and of course, our travels back home) but it was a great feeling to have accomplished so much in one day! 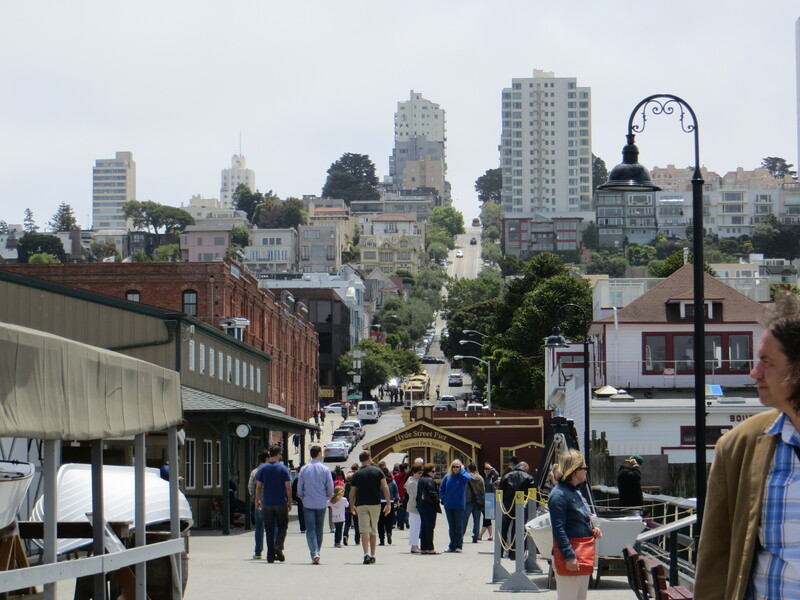 Have you ever visited SF? 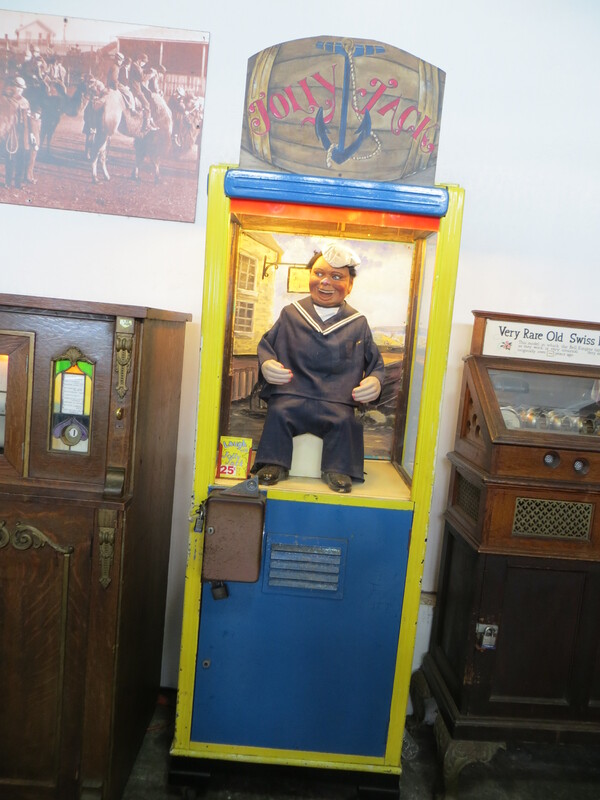 If yes…what was your favorite thing to see? If no…what would be at the top of YOUR bucketlist? We have a condo on Powell & Pine and try to visit at least once a year. San Francisco is my favorite city in the entire world. I’ve lived on 5 of 7 continents but every time I get off the plane in SF I just feel like it’s home. 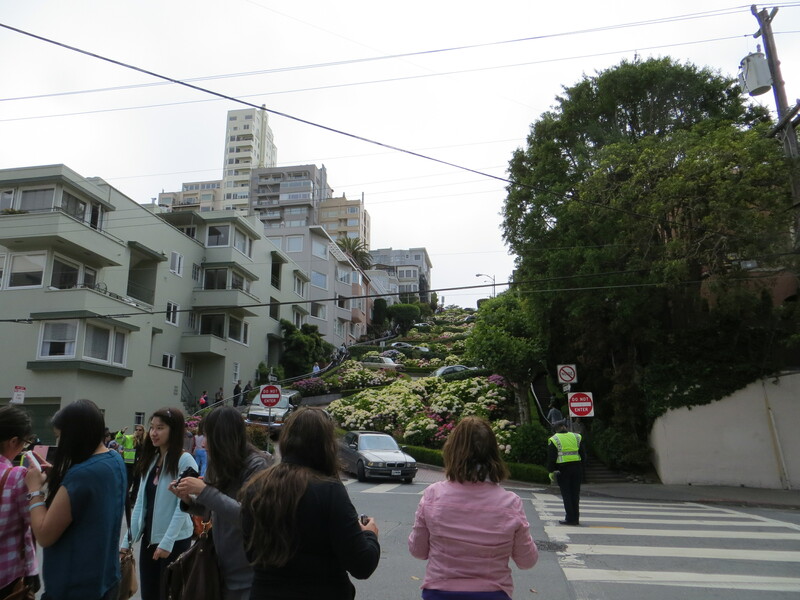 I’ve always wanted to tour San Fran! There are so many things to see and do there. Alcatraz is totally on my bucket list (is that weird?). Looks like you had a great time…and um that waffle looked fabulous. 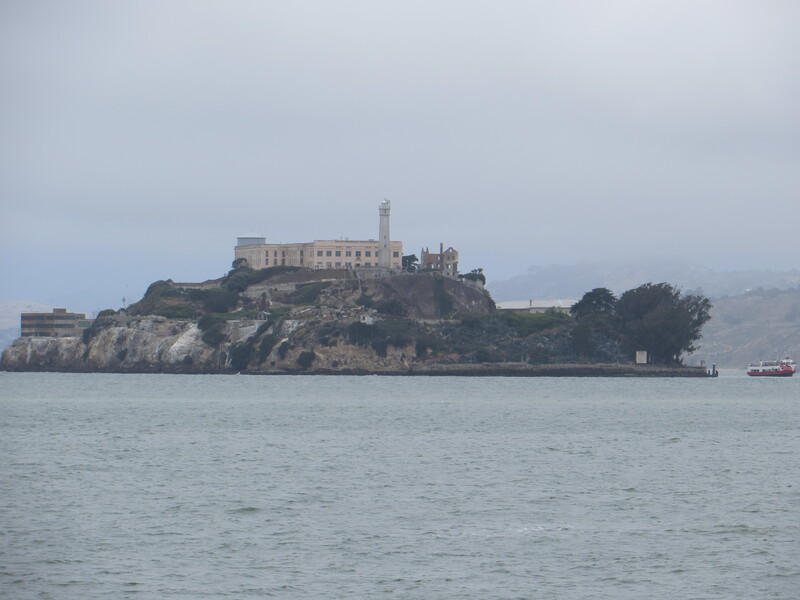 If you can, do Alcatraz on Halloween! 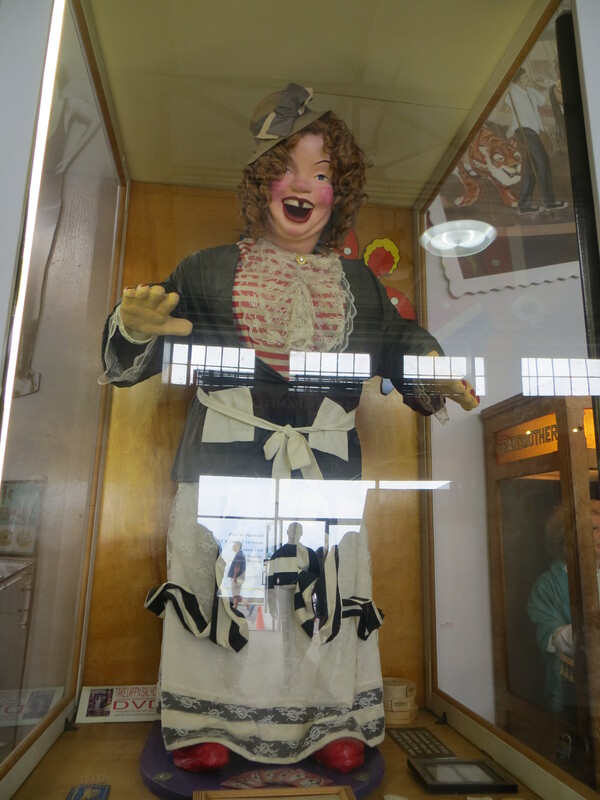 We did the tour one year on Halloween and it was spectacular. After the tour they do these stories/talks with the rangers as you walk back down to the ferry. Do the one on Al Capone. 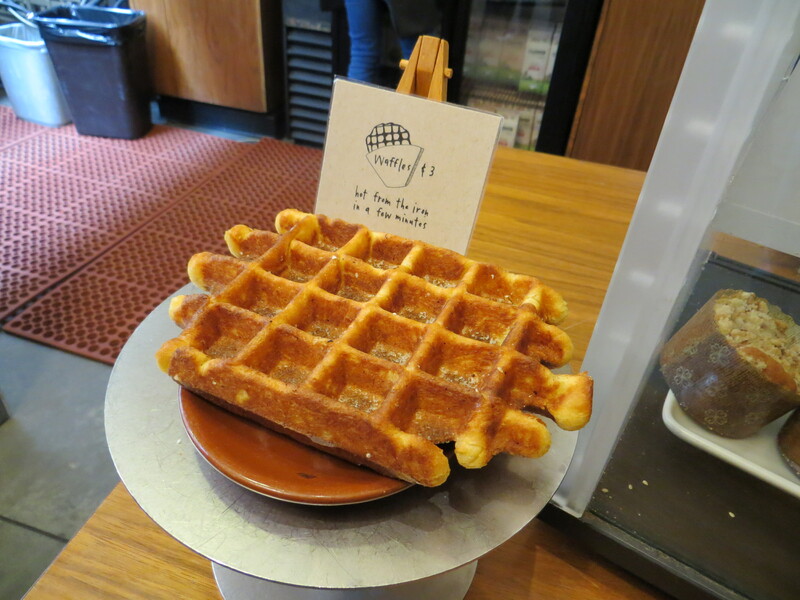 Hmm…Might need to brave the line and have this waffle (I’ve never seen it before, but then again, I totally take for granted that Blue Bottle is just there and that other places brew the coffee). 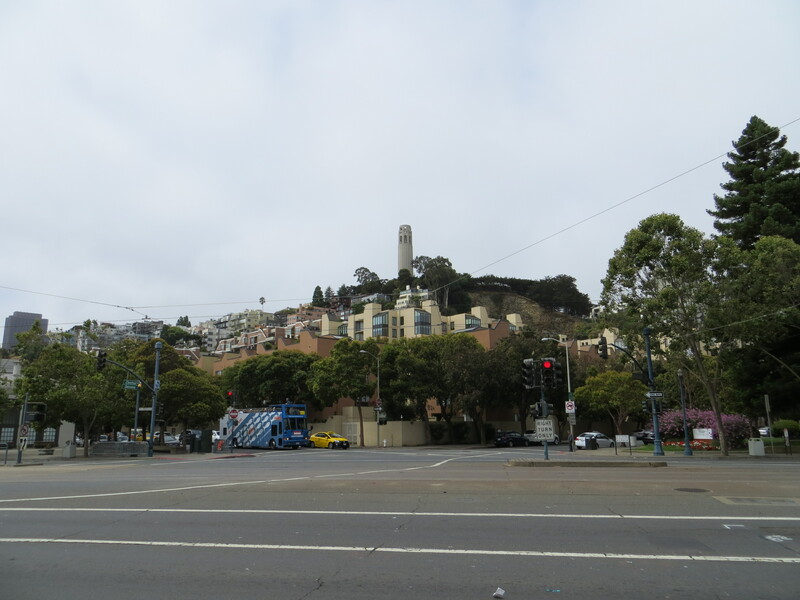 The walk/run up to Coit is a must, and one day I’ll head over to Alcatraz. 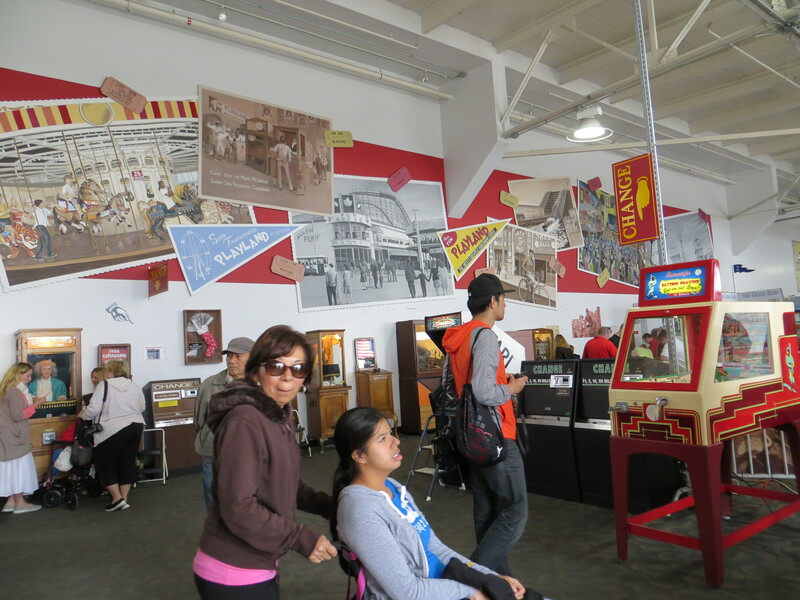 GGP and all its museums are a must visit, along w/ the Exploratorium. Oh my goodness! I can’t believe you managed to pack so much into one day! Sounds like you had a fantastic day of sightseeing though. We went to SF as part of our honeymoon in 2006. It was one of my favorite cities. 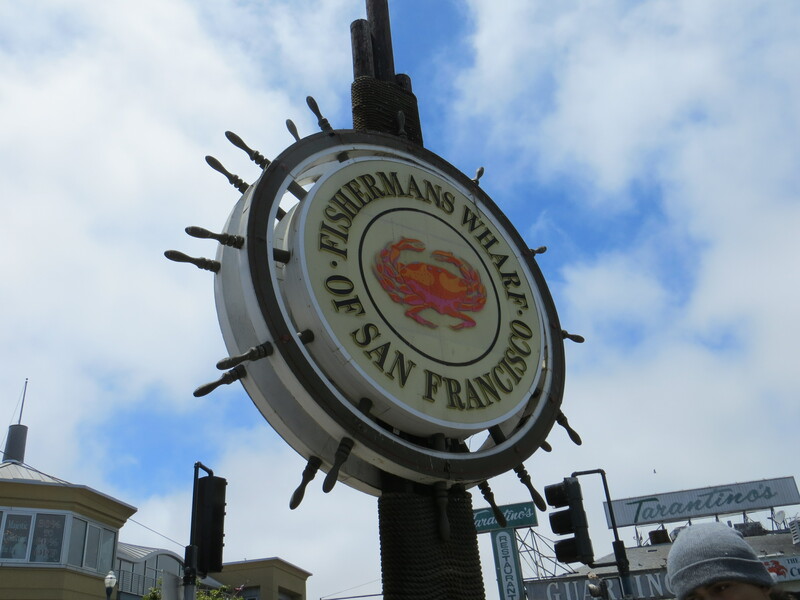 We stayed near Fisherman’s wharf, in the Argonaut Hotel, which was awesome. 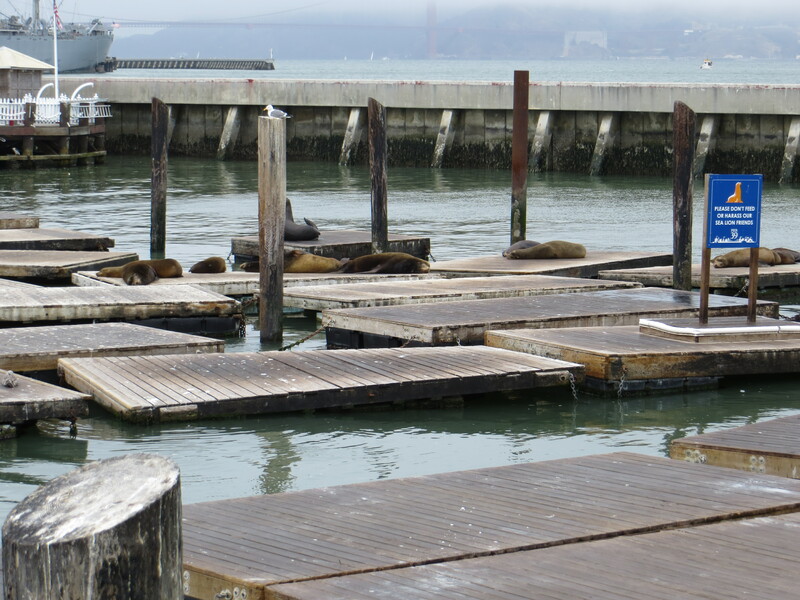 I loved the sea lions, the hills, visiting Alcatraz, and just wandering around. 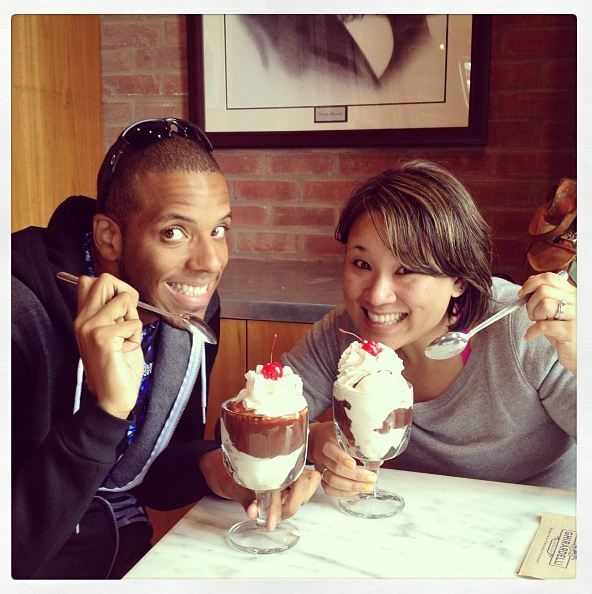 We had the most amazing meal at Boboquivari’s and absolutely had ice cream sundaes at Ghiradelli’s. This post brings back so many memories. That must have been an amazing trip! San Fran is one of my favorite cities in the whole country. I’ve been there many times as my mother use to live in San Jose so it was not a stretch to go for the day. 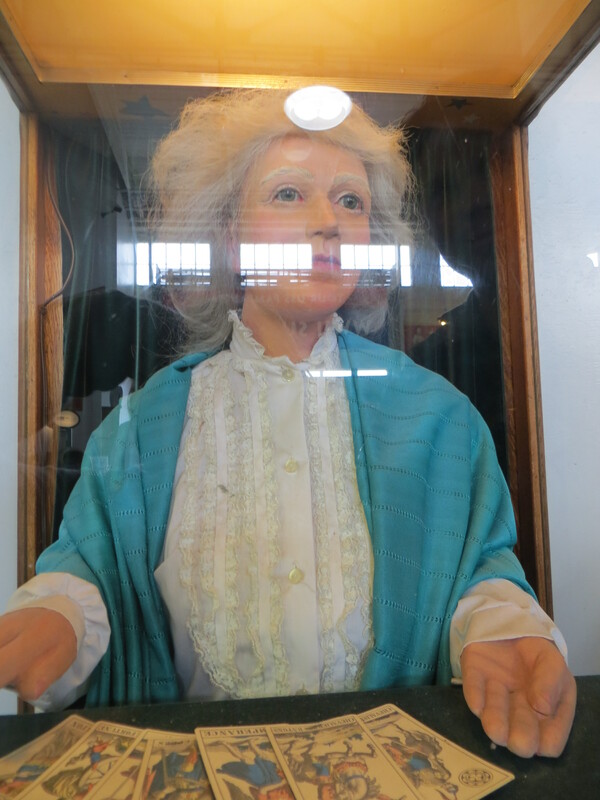 You definitely need to do Alcatraz next time you visit. I need to go back as I was rather large (pregnant with twins) and not allowed, due to the unseasonable heat, to do parts of the tour. Somehow I cannot believe that you’ve never been there, C! You’d definitely love it. It looks like you made the most of your quick trip. I am shocked you didn’t get a Kara’s cupcake though! LOL, Tasha! I was in a sugar coma after Ghiradelli’s! 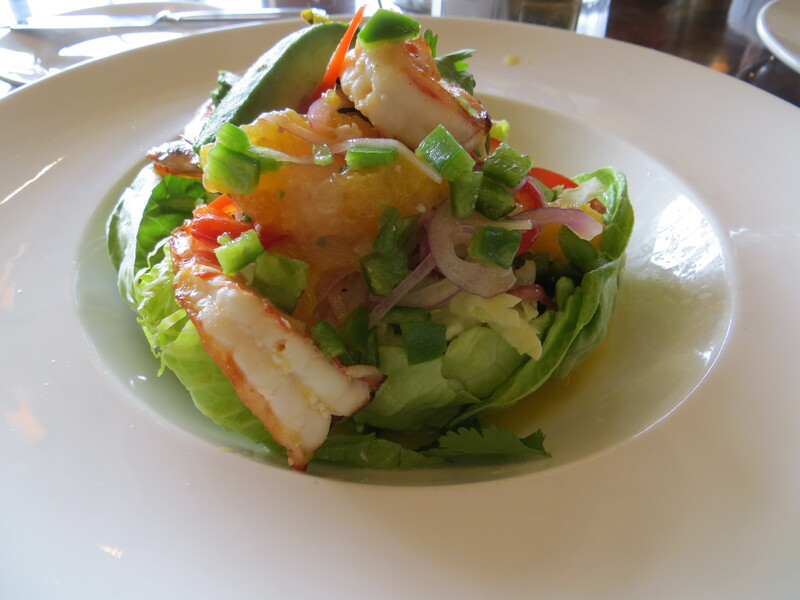 Glad you enjoyed your trip out to the BEST COAST! The crazy thing is that I get excited every time I get to go to SF and see all those spots and I am only 90 minutes away … it never gets old going to the city. YOU ARE SO RIGHT, CHRIS! Left coast is the best coast. I cannot wait to visit again!!! It was great to meet you. 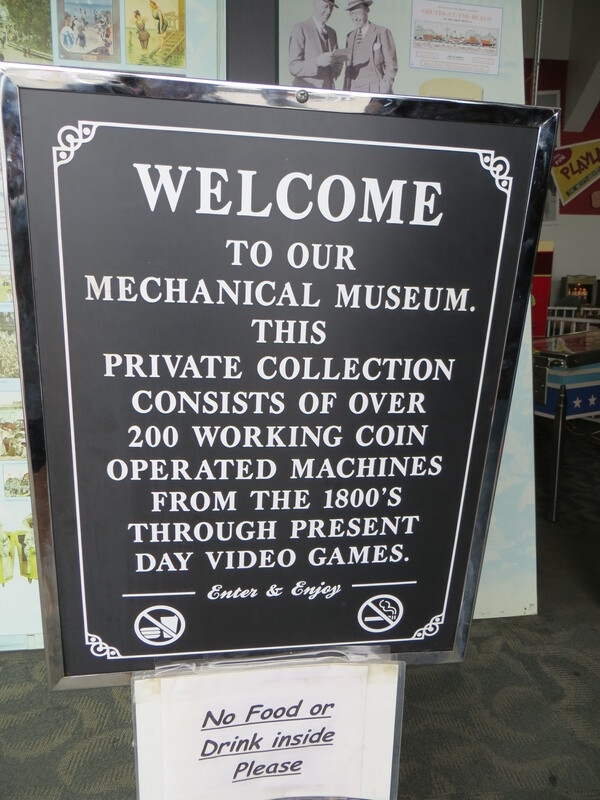 I was there a couple weeks ago for business. I only had a few hours of play time on my last day so I made it over to Lucas Film and the the Walt Disney Family Museum. I loved it and would love to go back one day. I love SF!! 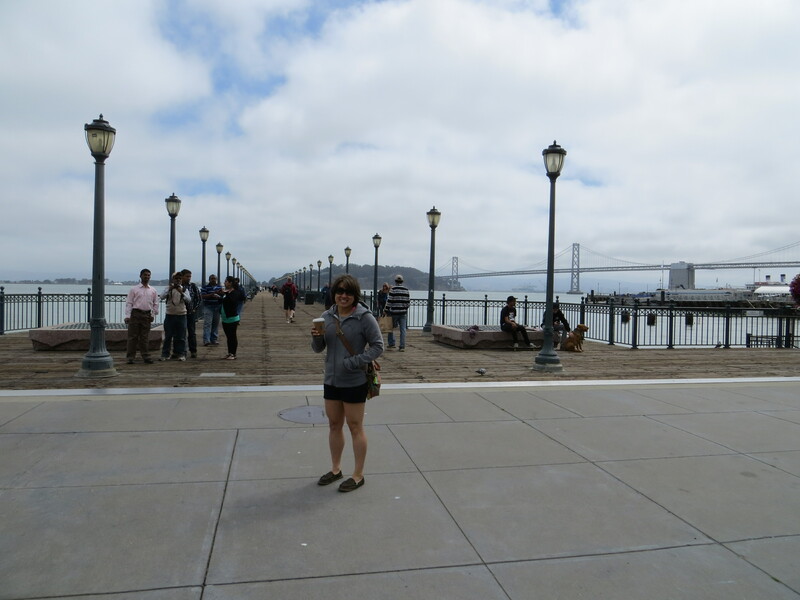 I haven’t spent a lot of time there, but I love walking along the waterfront (and of course ending up at Ghiradelli Square! yum!). Alcatraz is incredible. 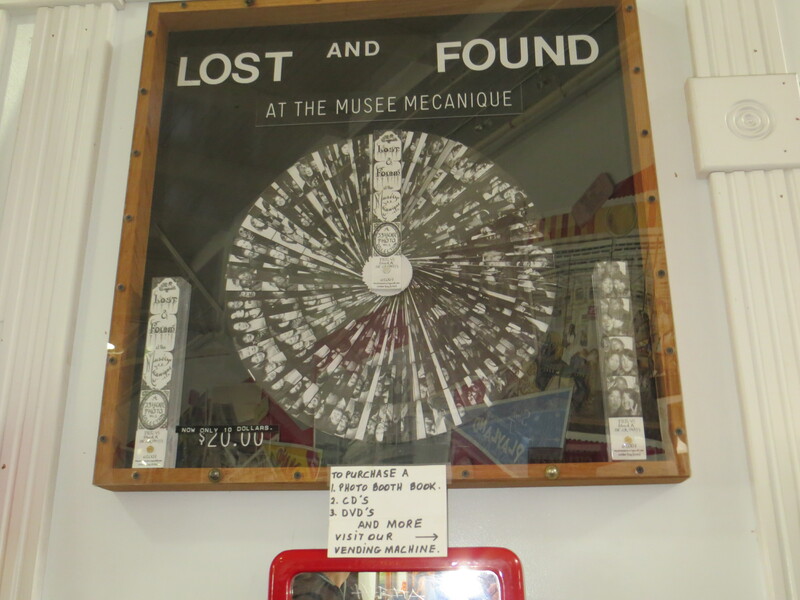 Musee Mecanique looks really interesting – I’ll have to put that on my list for my next trip there.